Firefighters from numerous Siskiyou County firefighting agencies will participate in a two day exercise designed to promote interagency coordination on Saturday, June 21 and Sunday, June 22, 2014. Most years wildfires occur in Siskiyou County. Because fires don’t recognize land or agency boundaries it is crucial that responders from all agencies work together taking an “all lands” approach to battle wildfires. As the past several years have proven, this training event is critical to getting all responders together to train as one unit so they are better equipped to fight fires as a team. The training event, located at the College of the Siskiyou’s (COS) in Weed, is divided into six different venues where interagency strike teams utilize fire equipment. The evolutions will consist of Fire Shelter Use and Vehicle Safety Inspections, Establishing a Water Supply, Progressive Hose Lays, Constructing Hand Line, Dozer Safety and Wildland Urban Interface Tactics. For this training lights and sirens will not be used. If you see emergency equipment traveling with their lights and sirens on, it is a true emergency and not part of the Eric Hall Memorial Interagency Drill. During the drill firefighters and fire equipment will be out on the roadways working so please be cautious. The event begins with a morning briefing that will be held at COS at 7:00 A.M. and ends with an evening briefing at 5:00 P.M. Members of the public are encouraged to stop by. There will be an Information Officer available to answer questions from the media or residents. Conduct all exercices for maximum learning potenial. The Burn Ban suspends all residential burn permits, forest management, hazard abatement, and other industrial-type permitted burning within the 31 million acres of State Responsibility Area. Due to the dry conditions we're facing because of the drought in California, the head of CAL FIRE ordered the suspension of all burning for the summer. It does not apply to designated campsites, but it does apply to 31 million acres of land throughout California that CAL FIRE is assigned to protect. Campfires within organized campgrounds or on private property are allowed if they are in a designated campfire site that prevents fire from spreading outside the site. Grilling in the picnic areas are not allowed, but gas and propane stoves can still be used. 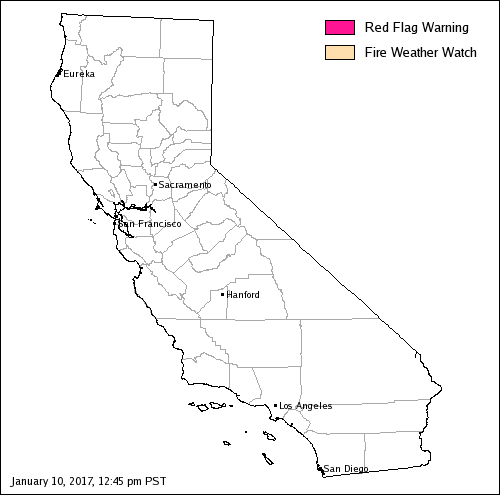 Red Flag Warning in effect for gusty winds and low humidity Lake Tahoe Basin and West Sierra front. National Weather Service - Reno has extended the Red Flag Warning in effect until 2300 this evening for gusty winds and low humidity for the Lake Tahoe Basin and the western Nevada Sierra front. TO THE GUSTY WINDS...VERY DRY AIR WILL BE IN PLACE WITH POOR OVERNIGHT RECOVERY AND AFTERNOON VALUES IN THE SINGLE DIGITS. EVENING FOR GUSTY WINDS AND LOW HUMIDITY FOR THE LAKE TAHOE BASIN AND THE WESTERN NEVADA SIERRA FRONT..
* AFFECTED AREA...FIRE ZONE 272 GREATER LAKE TAHOE AREA AND FIRE ZONE 450 WESTERN NEVADA SIERRA FRONT. * WINDS...WEST 15 TO 25 MPH WITH GUSTS TO 40 MPH. RIDGE GUSTS TO 60 MPH. * HUMIDITY...FALLING TO 6 TO 12% ALONG THE SIERRA FRONT AND 10 TO 20% IN THE LAKE TAHOE BASIN BY AFTERNOON. * IMPACTS...THE COMBINATION OF GUSTY WINDS AND LOW HUMIDITY WILL CREATE CRITICAL FIRE WEATHER CONDITIONS. A RED FLAG WARNING MEANS WEATHER CONDITIONS CAN CAUSE FIRES TO GROW RAPIDLY BEFORE FIRST RESPONDERS CAN CONTAIN THEM. AVOID DOING OUTDOOR ACTIVITIES THAT CAN CREATE A SPARK NEAR DRY VEGETATION...SUCH AS YARD WORK...TARGET SHOOTING...OR CAMPFIRES. CA-MMU Haigh Fire Mariposa County, No structures damaged. One minor injury reported. Update 6-12 1500: 130 acres, 75%, No structures have been damaged. One minor injury has been reported. Update 6-10 1620: IC stating that the fire jumped the road and this will be an extended attack incident. Requesting 10 additional engines, 4 dozers, and 4 strike teams. 3 copters on scene, 1 more on order. Other Comments: CDF Prevention and Sheriff's Dept en route for a marijuana grow site at the location of the fire.It’s the third wildfire in Mariposa County in recent weeks. New revelations emerged about the Police officer's past. Lawyer: Ego is reason #CHP handcuffed firefighter "We want #CHP to acknowledge that firefighters are in command"
CHULA VISTA, Calif. - A Chula Vista firefighter who was handcuffed by a California Highway Patrol officer at an accident scene earlier this year has filed a lawsuit against the state as new revelations emerged about the officer's past. In early February, at an accident scene on Interstate 805 in Chula Vista, firefighter Jake Gregoire said he parked his engine to protect the ambulance from traffic. He said he was handcuffed after veteran CHP Officer Sergio Flores barked at him to leave the scene. "I couldn't live with myself for the rest of my life that someone could potentially be injured because I didn't stand up for what I believe in," Gregoire said during an interview in March. After the two agencies' supervisors went back and forth for half an hour that night, Gregoire was released. The agencies involved called it an isolated incident, which upset Gregoire. He said he knows of altercations involving Flores and firefighters attempting to park, before and after his incident. Dan Gilleon, Gregoire's attorney, said he uncovered a documented 2010 incident involving Flores threatening a firefighter with arrest. Gregoire filed a claim, but offered to drop it if policies were changed. Gilleon said the state rejected that idea, leading to Gregoire's lawsuit alleging civil rights violations. "He knows if he back down, this is going to happen to someone else," said Gilleon. Gilleon said the suit will include Flores' past acts. In 1999, an attempted traffic stop in Ocean Beach ended with a foot chase in an alley. After the suspect, Walter Wacik-Santamaria, was handcuffed and immobilized by four CHP and San Diego police officers, he heard one officer talking. "What he says to man is 'don't you know you don't run from police,' before someone twisted the ankle, stepped on it and broke his ankle," said Gilleon. While it's unclear who did what, a jury found Flores and another officer liable for the battery, awarding a judgment of nearly $600,000, which included attorney fees. "This is a sign of supreme arrogance and a sign this man is a dangerous man in uniform," said Gilleon. Flores was not criminally charged in the Ocean Beach incident. It's unknown if he was disciplined. Team 10 asked the CHP why Flores kept his job after the incident. 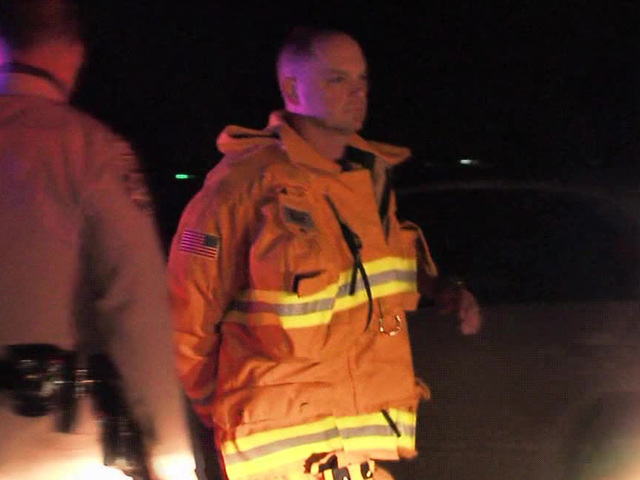 The CHP declined to make any comments, but did confirm he remains on the force. Mostly wet strikes centered over the central Sierras. Nine lightning fires today on the Sierra NF. Two loads of jumpers, 3 hotshot crews, and air tankers from USFS and Cal Fire have kept all of them small. More lightning was received today as well. Strong west winds over 50 mph will be possible Thursday and Thursday night across the highest elevations of the Sierras eastward into Mono County. The 22 year old man was arrested by CAL FIRE law enforcement after an investigation that included CAL FIRE, Montague Fire Department and the Mt. Shasta Fire Protection District, per CAL FIRE Public Information Officer Suzi Brady. A 22 year old Montague man was booked into Siskiyou County Jail Tuesday afternoon on 33 counts of arson, according to a CAL FIRE news release. Yreka, Calif.- 22 year old Tavin Minium is accused of setting 33 vegetation fires Tuesday morning, June 10, along West Webb Street in the city of Montague. He was arrested by CAL FIRE law enforcement after an investigation that included CAL FIRE, Montague Fire Department and the Mt. Shasta Fire Protection District, according to CAL FIRE Information Officer Suzi Brady. She said fire suppression units from CAL FIRE and Montague Fire Department responded to the 33 fires to ensure they were completely out. SAN BERNARDINO COUNTY, Calif. — A Los Angeles Fire Department pilot was killed in a single-engine plane crashed Monday at El Mirage Dry Lake in San Bernardino County. Fire officials identified the pilot as Brian Lee, 47. A child passenger was also hurt. The boy is no older than 10, officials said. The initial report of the crash misidentified the plane as a helicopter. It is unclear how severely the boy, who officials described as no more than 10, was injured. Shortly before noon, San Bernardino fire officials tweeted that two victims were being airlifted to a hospital after the crash of a small plane. According to a post about Lee's death on the LAFD's official blog, off-duty colleagues witnessed the crash and rushed to help. Update 1400: -One tanker staying in orbit all others return on load and hold. Copters to work left flank which is still hot. gaining control with head wrapped. OCFA Chief Keith Richter Will Leave Aug. 29 After 37 Year Firefighting Career. Orange County's top fire chief stepped down Tuesday amid controversy and a scathing audit that said the county fire authority suffered from poor morale and inconsistent leadership. Orange County Fire Authority Chief Keith Richter said he will leave the department Aug. 29, to coincide with the 37th anniversary of his firefighting career. The agency’s board is expected to form an ad-hoc committee to search for a successor. “Our agency faces challenges in the future,” said Al Murray, vice chairman of the fire authority and the mayor of Tustin. “We’ll be asking our next chief to move our agency forward and address these issues head on." A management audit released in May found “serious issues” within the agency regarding its accountability, discipline and leadership. Officials and employees of the Orange County Fire Authority Employees interviewed for the audit said leadership was lacking, disciplinary actions were inconsistent and promotions often went to those who fell in line with the chief. The report also said that bullying, harassment and retaliation are perceived to be common within the authority. The fire agency, which serves 23 cities and unincorporated Orange County, is governed by a 25-member board of directors. It also has an executive committee that offers guidance on day-to-day operations. Orange County Supervisor Todd Spitzer, who is on the fire authority's board of directors, had called for Richter’s resignation after the audit was released. The agency was recently in the news after an audit found that half the hazmat inspections it billed businesses for were never actually conducted. In a recent interview with the Times, Richter said that in addition to the bad press, recent labor negotiations have negatively affected morale. In the report compiled by Management Partners, employees also said that discipline within the agency is not timely or consistent. Before serving as OCFA fire chief, Richter was chief of the Contra Costa Fire District for more than 10 years. He joined the Tucson Fire Department in 1977 as a firefighter. The Fire Chief is appointed by, and serves at the pleasure of, the OCFA Board of Directors. The Fire Chief functions as the Chief Executive Officer with oversight of all general activities within the Fire Authority, along with external relations with community groups, and city, county, state, and federal government officials. 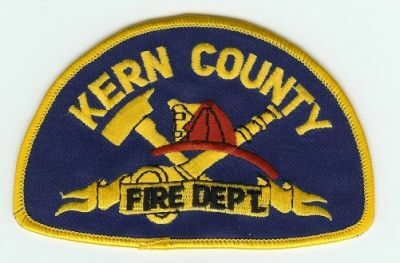 This Thursday evening there will be a special training exercise put on by the Kern County Fire Dept. Tehachapi area residents hearing helicopters whizzing by and firefighters active out at Cummings Ranch on Thursday night, June 5, will find a major Southern California exercise in their midst. It is an honor to be hosting this years night vision training exercise which consists of various agencies from around the south land. There will be activity around Tehachapi Airport, Brite Lake and Cummings Ranch involving water drops and controlled burns. On June 5, 2014 the Kern County Fire Department will be hosting the Southern California Interagency Night Vision Goggle Fire Suppression Drill in the Greater Tehachapi area. Kern County Fire Department, Orange County Fire Authority, Los Angeles City Fire Department, Los Angeles County Fire Department, Ventura County Sheriff, San Bernardino County Sheriff/Fire, and the US Forest Service will have aircraft participating in the drill. The drill will begin at 2:00 PM with aircraft arriving at Tehachapi Municipal Airport, the Drill Helibase. The airport’s east ramp will be closed to other aircraft and access will be limited to drill participants, Fire Service observers, and support staff only. Aircraft will conduct area familiarization flights in the afternoon and commence fire suppression operations at approximately 8:45 PM, completing the drill at approximately 1:00 AM on June 6th. Fire suppression apparatus, including crews, engines, and dozers will be stationed at the burn site on Cummings Ranch. Helicopters will fly circuits from the Helibase to the Tank-Fill site near Brite Lake, to the fire on Cummings Ranch, drop their water and return to the Helibase. Firefighters can’t always protect every home from wildfire — especially if property owners haven’t done their part to prepare. Property owners can take important steps around the home to make it safer for them, their family and their neighbors. Start now by setting an example and helping to create Fire-Adapted Communities (FACs) before the next fire approaches! • Talk to the local fire department about how to prepare for a wildfire, situational awareness before a fire, when to evacuate, and what you and your community should expect during a response. 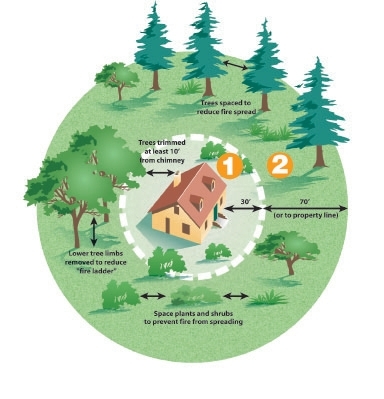 • Use the Wildfire Home Assessment and Checklist to conduct a risk assessment on your property. – Maintaining a “fire-free” area around the perimeter of your home. – Managing vegetation along fences. – Clearing debris from decks, patios, eaves and porches. – Selecting proper landscaping and plants. – Knowing the local ecology and fire history. – Moving radiant heat sources away from the home (i.e., wood piles, fuel tanks, sheds). – Thinning trees and ladder fuels around the home. • Develop a personal and family preparedness plan. local or county ordinances you should be following. • If you have a homeowners’ association, work with them to identify regulations that incorporate proven preparedness landscaping, home design, and building materials use, such as Firewise. • Sign up for and participate in the Ready, Set, Go! Program. • Provide input to the local Community Wildfire Protection Plan. • Ensure fire department’s proficiency in wildland fires, fuels, operational techniques, safety procedures, qualifications, equipment and response. • Review construction developments in the Wildland Urban Interface. • Know availability of fire suppression resources and the public’s expectation of response. • Discuss current level of preparedness/response collaboration with local emergency management and public safety agencies. • Promote role of secondary assets like Fire Corps or Community Emergency Response Teams. • Build relationships with planning, zoning, and building code development and enforcement staff. • U.S. Fire Administration’s Wildfire … Are You Prepared? at www.usfa.fema.gov. • Be Red Cross Ready: www.redcross.org/prepare/disaster-safety-library. From LAFD Blog: Rattlesnake Do's and Don't's LAFD responded to 120 snake incidents last month alone. LOS ANGELES - Increasing temperatures draw people and snakes alike to the outdoors, and encounters between the two are inevitable. While Los Angeles has a variety of snakes, most of which are benign, there is an exception, the rattlesnake. Generally rattlers are not aggressive and given the chance they will retreat, but you certainly don't want to provoke one. The California Poison Control Center notes that rattlesnakes account for more than 800 bites each year with one to two deaths, and many are surprised to learn that the Los Angeles Fire Department responded to 120 snake incidents last month alone. Don't hike alone. Always have someone with you who can assist in an emergency. Don't go barefoot or wear sandals when walking through wild areas. Over-the-ankle hiking boots are preferred. Don't leave the well-used trails. Avoid tall grass and weeds where snakes may hide. Don't step or put your hands where you cannot see. Don't handle a freshly killed snake, it can still inject venom. Do carry a fully charged cell phone to call 9-1-1. Do wear loose-fitting long pants when hiking. Do check out stumps or logs before sitting down, and shake out sleeping bags before use. Do use caution when stepping over a doorstep as well. Snakes like to crawl along the edge of buildings where they are protected on one side. Do stay calm if you are bitten. This sounds trite, but will save your life. By becoming agitated, your heart beats faster and you increase circulation of the toxin. This may help in remaining calm: About 25 percent of the bites are “dry,” meaning no venom was injected, but the bites still require medical treatment. Keep your fingers crossed you're the 25%. Do remove watches, rings, etc, which may constrict swelling and become stuck. Do immobilize the affected area. Do remember to have fun when outdoors and use common sense!